In a way Rasen no Kakera, by Kaimu Tachibana, can be in the same category as Please Save My Earth. Where Rin, Alice, and the other characters are reincarnations of people from space observing Earth. Rasen no Kakera (which I keep referring to Kaken no Rasera ^^;) follows the same story line of dealing with your past life and the consequences of finding the people who were involved. The story starts out with three incarnations, Sakuya, Wakyou, who are upset at Hijirou who they consider as their mentor and their guide in ancient magical Japan. Luckily, the story doesn’t go through the torturous process of trying to find the other reincarnations. Right away in volume one we meet them. In comes Makoto who had flown all over Japan (he literally floats to Kazuki) and introduces himself as Wakyou. Present day Kazuki finds out that he is the reincarnation of Sakuya and Makoto is the reincarnation of Wakyou, and luckily they were also reincarnated with their past lives’ powers. Scenes later, Makoto transfers to Kazuki’s school and both are slowly becoming friends, just like their reincarnations were in the past. It seems as though Makoto wants to find Hijirou more than Kazuki does. 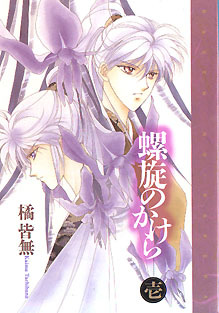 They meet Masayuki who Kazuki believes is the reincarnation of Hijirou. It seems as though they aren’t the only ones looking for Hijirou’s reincarnation. Before they can tell Masayuki (who seems to be clueless about his past life) Masayuki gets taken to another dimension! Makoto goes after him leaving Kazuki in present day Japan! What will happen to Makoto? Who is Ruki and who does she know that Makoto has powers? And who is the furry eared demon that took Masayuki away? Is he on their side or does he have is own selfish reasons to find Hijirou’s reincarnation. A warning to those who would like to find Rasen no Kakera, the series is a ten volume series using the chinese number system, but some numbers are replaced with kanji. For later volumes I would suggest asking the store to open the wrapped manga and looking under the dust jacket. On the cover of the manga itself is the volume number in english. (1, 2, 3, etc.) I accidentally picked up vol two instead of volume one and then I had to wait a month or two before the store restocked so I could find volume one and figure out what the heck is going on in the story. This is also the kind of manga that has furigana on the names and then it drops the furigana on the sides of the kanji, but its worth the effort!